They Need Him, So Why Was Michael Sam Cut From the Dallas Cowboys? 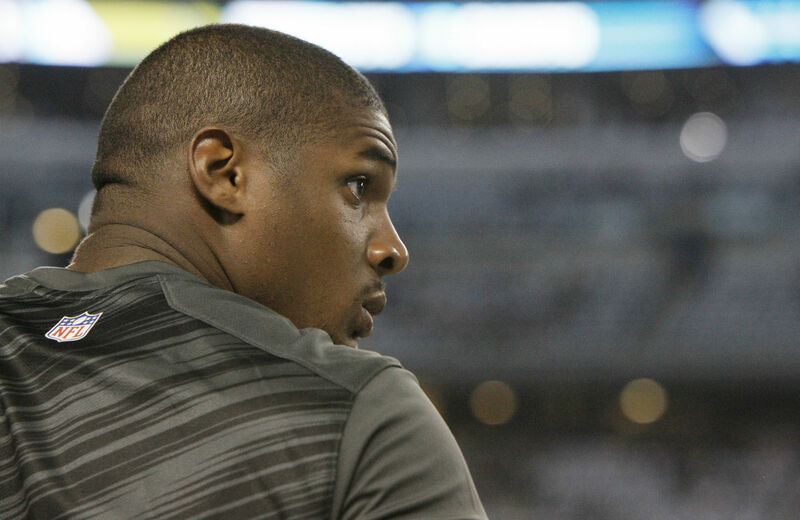 Michael Sam’s efforts to become the first openly gay player in NFL history took a massive hit on Tuesday, with news that he was being cut from the Dallas Cowboys. The set-up seemed preordained, written up by a hacky Hollywood screenwriter. Here are the Dallas Cowboys, the surprise juggernaut of the 2014 NFL season. They have all the Super Bowl ingredients: a fearsome offensive line, a healthy and surprisingly calm Tony Romo at quarterback, and a record-breaking running back in DeMarco Murray. The one thing they’re missing, an essential in today’s pass-happy NFL, is the ability to rush the passer. This is a Cowboys team with only six sacks on the season and not a single player with more than 1.5. There on the practice squad is a son of Texas, Michael Sam, whose chief commodity as a college All-American was his ability to get off the edge and drop the quarterback. The script was written for Sam to be promoted to the roster, and making a needed contribution to a dream season in Big D. Instead, it was announced on Monday evening that Michael Sam was being cut from the organization. The three sacks and eleven tackles in four games Sam garnered in preseason with the St. Louis Rams meant nothing. He was gone. Oh, by the way, if Sam had been brought up to the main squad, he would have become the first openly gay active player in NFL history. Did this have anything to do with his release? After all, Sam fulfilled a position of need on a team achingly close, after years of mediocrity, to being on the inside track to the Super Bowl. It is a legitimate question, given the groundbreaking nature of Sam’s efforts and the risk-averse reality of today’s NFL. Even though he, by every account, had been quiet to a fault and just worked hard on the practice squad, the widespread, whispered, off-the-record, belief has been that he would be a “distraction” and was only on the team because of NFL pressure, not to mention team owner Jerry Jones’ inexhaustible desire for publicity. Why would Garrett be so dismissive of Sam? Maybe it has something to do with why Sam was on his practice squad in the first place. Sports Illustrated’s Peter King reported that after Sam was cut from the Rams and spent almost three days without a spot on an NFL team, “a league official contacted multiple teams asking if they had evaluated Sam as a probable practice squad player. Now Sam and the NFL avoided a nightmare situation when he signed with the practice squad of the Dallas Cowboys.” The league offices have denied this, but we have to remember, as we have all learned this fall, that you know the NFL is lying when their lips are moving. That perception is hard to shake. One wonders whether Sam will get that opportunity. As of now, it looks like he was caught in a vise between NFL headquarters pushing to get him on the Cowboys practice squad and the lack of desire by any franchise to want to be “the ones” to actually put themselves out there and give him an honest chance. It is ironic that the Dallas Cowboys, a team defined for so many years by “distractions,” starting with their own endlessly embarrassing owner Jerry Jones, are now finally winning and therefore want no part of the non-football-related attention Michael Sam brings. This is still like a Hollywood movie. Only now it reeks of farce.